If there’s something about France that piques your fancy, you may want to consider retiring there. You can expect to find a high quality of life in France and all of the modern conveniences you might desire. Better yet, the food, wine, fashion and art will make your life an interesting and impressive cultural mix that you will be unlikely to match anywhere else in the world. As long as you are willing to learn the language, once you relocate there, it won’t be all that long before you start feeling like the country is your second home. France is one of the hottest tourist places today, and it also draws many retirees who, once they get there, often want to stay. It may be the leisurely pace of life that appeals to older Americans. But just because things are slower there does not mean they are less sophisticated than in the United States. In fact, in addition to the world-class museums, four-star bistros and first-rate theatre, you will find all of the state-of-the-art technology you will need to stay connected with the rest of the world instantly, via phone or high-speed Internet. The weather in many parts of France is also a benefit. In central and eastern France, the winters can be long and cold, but the southern, northern and northwestern parts of the country have milder climates that can be appealing. If a mellow winter is a magnet for you, you may want to explore those areas where the temperature rarely drops below freezing and summers are very pleasant. Beyond the variations in climate, the features that each region offers differ widely. If you want a remote countryside location, or a village rich with history and architect, you can find it in France. Further, you can also find mountains, waterways, nightlife and gourmet food and wine if you know where to look. The key is to do your homework to decide what you like and in what area you are most likely to find it in your price range. No matter what region attracts you, chances are the delicious food will be something you’ll want to write home about. France is known for exceptional quality and freshness when it comes to meat, produce and baked goods. Some of the restaurants are also very reasonably priced, as long as you steer clear of the popular tourist traps. When it comes to living, shopping and eating out, you just have to know where and when to go to get what you desire while still staying within your income level. The French healthcare system has been cited as one of the best in the world. Yet surprisingly, this high-quality care is provided at significantly less cost than you’ll find in the United States. Medications are also much less expensive. It is important to note, though, that while the care costs less, you will need to purchase private health insurance to cover most of the expense. The good news is that the cost for such insurance is extremely affordable in France. Private health insurance averages about $1,500 per person a year. Of course, premiums may vary, depending on your age and general health. If money is a concern, you can look into reducing costs by buying insurance as a member of a larger group or association, which can reduce the premiums by as much as 50 percent. If you’ve always dreamed of living in a large Parisian flat, you will need to have a good nest egg or a large pension to cover the expense, which can be substantial. In Paris, it can cost from $2,000 to $3,000 a month to rent a downtown apartment or a condo. Furnished places and top locations can set you back even more. But not everything in France is as costly. If you look to the countryside, you’ll find that not only the rental prices but also the cost of living overall will be much more reasonable. Rents in other areas start at about $700 a month and go up from there. A lot depends on how big a place you select and where it is located. Keep in mind that most rental prices in France include the cost of insurance and utilities. If, after renting for a while, you decide you are ready to invest in your own property, you will be pleased to know that the price to own a home in France can often be lower than in other European countries and even lower than in many regions in the United States. There are also no restrictions on Americans purchasing property in France, making it an appealing option. A home in a rural area in need of work may start at $60,000, while an apartment can range from $100,000 to $150,000. Of course, the price greatly increases the closer you get to the more popular locations. That being said, it can still be about half the cost to buy an apartment in Paris than in New York City, even though rents and other living expenses are comparable to the Big Apple. In addition, if money is no object, you can buy a larger renovated home or farmhouse in the countryside or in a charming village for a few hundred thousand on up. Expatriates who have relocated to France also talk about the high fees (as much as 10 to 15 percent or even more) associated with buying there, so this will need to be factored into your financial plan. France has a reputation for being very expensive for daily living expenses. This is true when it comes to food, entertainment and clothing, in large part because the country has a very high sales tax on items, which is also known as TVA (taxe sur la valeur ajoutée). The rate, which is just under 20 percent, is usually already included in the prices charged on items in France, rather than added on to the total, the way it is in the United States. Also keep in mind that some of the bigger expenses, such as rent, health care and education, are subsidized by the government, actually making them more affordable; so in the end, things even out somewhat. A single adult can expect to spend about $600 a month on meals, groceries, transportation and entertainment in France. You should also plan to allocate money in your budget for shopping, since Paris is the fashion capital of the world. You can find a wide variety of designer wear and clothing at all price levels. It’s relatively easy for an American to retire to France, as long as you have all of the proper documentation and paperwork in order. You will need check with a French consulate office in the Unites States to request a long-term visa. You will also need to show that your income will be enough to cover your living expenses. Usually a few statements from your pension will be adequate. In addition, you will need proof that your health insurance will be applicable in France, or you will need to purchase a plan from a French insurance provider. 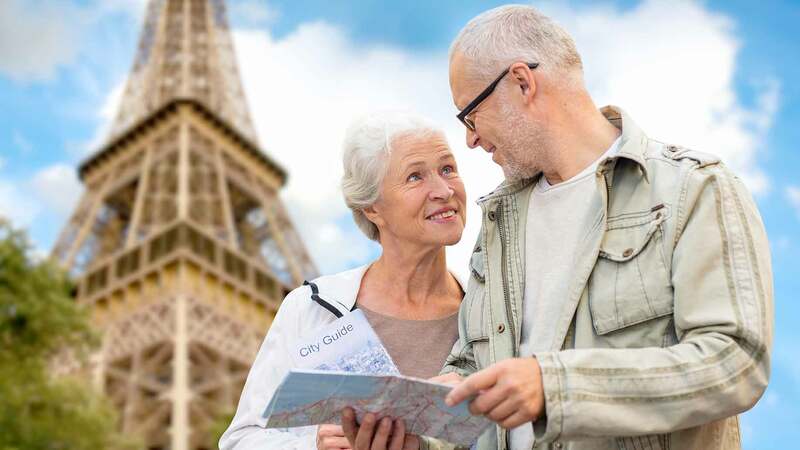 It is important to note that if you retire to France, you will be required to pay taxes there, which will be calculated on 90 percent of your pension. You should speak with a financial expert to find out more about this and to consider strategies that will be most beneficial for your situation.